The popular Weiand 2x4 intake PN50010 was designed for AFB or Edelbrock carbs back in the day. Problem is, the smallest cfm available is 500. Hot Heads now offers Offset Carb Adapter Kit PN80559, which allows installation of two 390 cfm or larger Holley carbs. on the Weiand 2x4 intake as well as the Dodge "Offy" 2x4 intake PN5012. The smaller 390's are much easier to tune in and with 780 combined cfm, will make a much better air/fuel mixture resulting in more horse power as well as better fuel mileage. 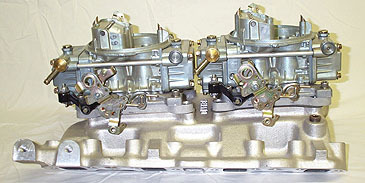 The kit includes two offset carb. adapters. P/N 80559 Offset Carb Adapter Kit $ 90.60pr.